How does hundreds of extra dollars in your pocket each year sound? If you’re a homeowner, that’s what you could be receiving through the state’s STAR program, which provides 2.6 million homeowners in New York State, including nearly 85,000 in our region, with savings on their school property tax bills each year. State Senator Patty Ritchie is shown with staff members from the St. Lawrence County Real Property Tax office at her STAR Workshop at the Gouverneur High School computer lab. Pictured from left to right are Darren Colton, Debbie Roy, Patricia Fletcher and Deanna Stevenson. 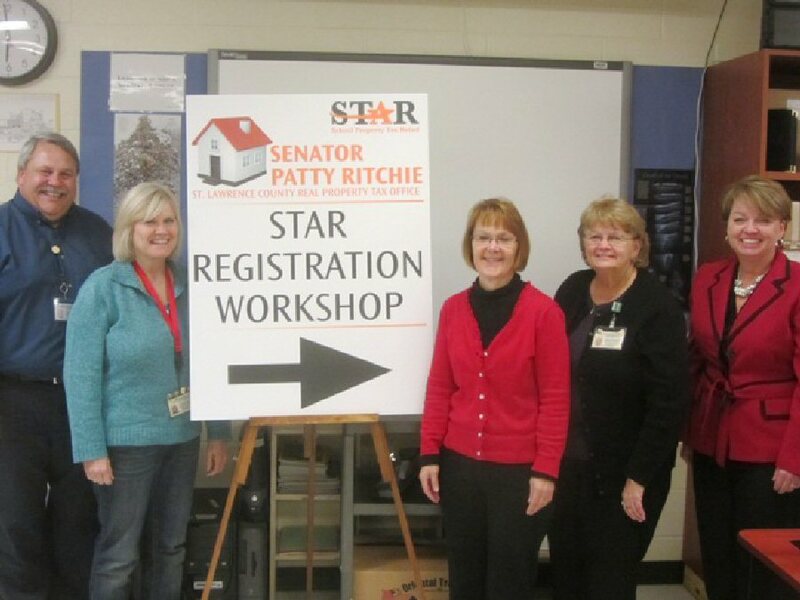 Recently, dozens of people in the Central and Northern New York region re-registered for this money saving program through my STAR workshops, held in Watertown, Gouveruer and Pulaski. Made possible with the help of local assessors, these events were aimed at helping those who currently receive Basic STAR re-register for the benefit, as a new state law aimed at streamlining administration of the program, and also helping to prevent fraud, requires current enrollees to reapply. The requirement does not affect senior homeowners who are enrolled in Enhanced STAR. The Basic STAR exemption is available for owner-occupied, primary residences where the combined income of resident owners and their spouses is $500,000 or less. Married couples with multiple residences are only eligible to receive one Basic STAR exemption. I’ve been working hard to spread the word about re-registering for this money-saving program, and as a result, more than 1,100 homeowners have clicked through my website to reapply online for Basic STAR. Currently, according to state officials, more than 20,000 Basic STAR enrollees in our region still need to re-register. I’m hopeful that 100 percent of program participants will reenroll by the December 31 deadline. Recently, Governor Andrew Cuomo issued a warning regarding deceptive STAR program solicitations. According to state officials, companies have been sending letters to homeowners offering to help them apply for their Basic STAR exemption in exchange for the first year’s tax savings. Please know that if you’re a homeowner, you can reapply on your own for free. There is no need to waste hundreds of dollars to have a company re-register for you. You can also call the special STAR hotline at (518) 457-2036. Representatives will be available Monday through Friday from 8:30 a.m. to 8 p.m. and Saturdays from 9 a.m. to 1 p.m.
Don’t miss out on the tax savings that you deserve. If you’re a homeowner who currently receives the Basic STAR exemption and you have not re-registered yet, don’t forget to do so by December 31.